Rave – I love seeing things like this. Makes me want to write a book about a character who drives a three-wheeled car. For the record, the driver looked pretty happy — he waved at me as I took this picture. Seen on 71 South ~ 3 wheeled car. Funniest part was they had a spare tire in the hatchback. Shades of Mr. Bean & his Robin. This entry was posted in Rave, Uncategorized and tagged 3-wheeled car, Mr. Bean. Bookmark the permalink. 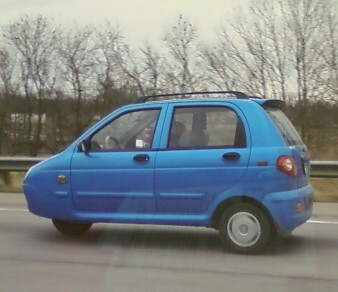 Funny…my husband used to work on Reliant Robin’s (3 wheeled cars!) in UK…he could sit in the drivers seat & poke his head up through the sunroof! Very funny to watch him drive around the place like that. That’s what I thought of too! Because we sometimes see Robins when we visit the UK, and of course, Mr. Bean did drive one. But this was something different. Have never before seen one in the US. Thank you! That was so funny!